Knights of Creativity Spirit & Ale: Do You Have Change for a Beer? On the night that the Pennsylvania polls shut down we found Barack Obama bringing his message of change to our hometown of Evansville, Indiana. It seems that we are now the big State to win for the Democratic candidates. Pennsylvania was asked to embrace too much of a change. They have never elected a black or a woman to Federal office, even though it is the seat of our democracy. Fellow Knight, Sir Edward of Philadelphia, the Governor of Pennsylvania, endorsed Hillary Clinton. What I like about Obama is that he personifies United through Diversity because he went through the University of Diversity in his life. 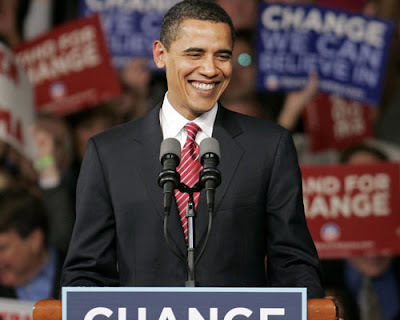 Born of a black father from Kenya and a white American woman, the former a Muslim the later a Christian; raised by a single mother; embraced by his white grandparents and making it through all these barriers to arrive to where he is today says much about the character of this man. My only regret is that I can't vote for him until November because I am a registered Republican who will be unable to vote in the Democratic Primary. McCain is an honorable man who I respect, but that doesn't mean that I have to agree with him just because he is a Republican. I personally wonder who has kidnapped my party, but that is a subject of another blog. There is no doubt that we are not only ready for a change, but must have a change for this great country to survive and thrive. Now on a lighter note, or perhaps an amber note, today is National Beer Day in Germany. 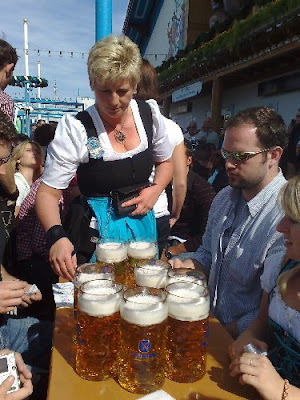 I remember watching one of these bar maids tossing out big lad in a beer hall in Munich. After carrying all these liters of beer they get a bit of muscle mass going on. So remember, when you're finding yourself in a political discussion today make sure that you ask for some change so that you can enjoy on of Germany's fine brews! I thought it was Hillary that was born a poor, black man in the South? Darn, I've got to read the papers more often. The big "O" brought in Mellencamp, that worth something. Next Knight meeting is in Oxford?